The Core classes focus on factors effecting the development and management of your business. The Client Interaction classes focus on ways in which you inter-personally relate to your clients through recognition and boundaries and help you to connect with your clients to provide a teaching environment. The Skills classes offer a variety of subjects to sharpen already present skill-sets or to add new tools to your toolbox to expand your marketability. IMPORTANT NOTE: Once you have completed the courses for a NAPO Specialist Certificate, you hold a certificate but you are not “certified” and may not describe yourself as such. 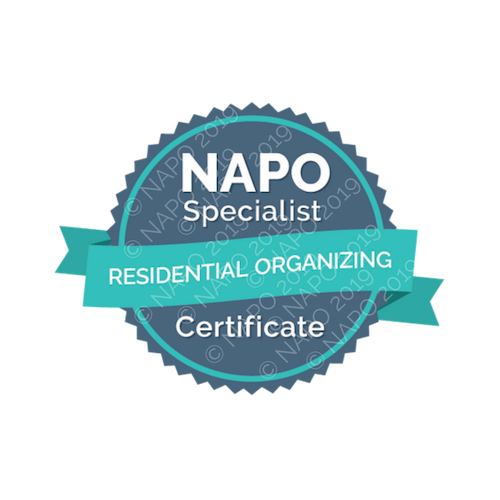 You must be a NAPO Professional Member to obtain a Specialist Certificate. Some courses are listed in both the Workplace Productivity and Residential Organizing Specialist Certificates. Two of the courses may be applied to both the Workplace Productivity and Residential Organizing tracks. To qualify, courses must have been taken within a 2-year window, prior to submitting your NAPO Specialist Certificate application. Course Collection bundles can be purchased at $325 for members. These bundles include all of the classes listed on the specialist certificate tracking worksheet, which allows you to complete the 8 required classes plus all of the other classes listed above. If you are interested in earning all NAPO Specialist Certificates (Household Management, Life Transitions, Residential Organizing, and Workplace Productivity) we suggest you review the benefits of the E-Learning Advantage priced at $899. The cost of coursework for each certificate begins around $350 for the on-demand sessions. Click the course links above for individual class pricing. Complete the NAPO Specialist Certificate application located below. You must be a Professional Member in good standing at the time of application. Your application will be reviewed. If the NAPO Specialist Certificate requirements are met, you will be sent your NAPO Specialist Certificate digital web badge from AH Validation Services. Note: Your completed application for the NAPO Specialist Certificate is subject to detailed audit.